Templates let you reuse the same structure and styles in numerous documents. Unfortunately, templates are misunderstood and underused because successfully implementing them requires a bit of specialized knowledge. Here are a few tips that will improve your template experience. Specific instructions are for Word 2016 but differences in earlier versions are insignificant. These tips also apply to Word 2003 templates, which you’ll create and access via the File menu. You’ll find most options via the Options command on the Tools menu. When you apply a template to a document, Word applies the template’s styles and structure to the new document. Everything in the template is available in the new document. This inheritance is good but can have unexpected consequences if you base a template on an existing document. 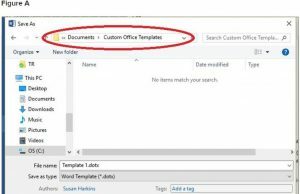 You can open a new document, modify it as needed, and then save the file as a template file. You can save an existing .docx document that contains all the styles and structural components you want in the template as a template file. The latter approach can offer unpleasant surprises because you don’t always remember everything that’s in the existing .docx file. In contrast, a template built from scratch contains only those elements you purposely added. For this reason, I recommend that you create a template from scratch and copy styles from existing documents into the template. Because of the inheritance behavior inherent in templates, I recommend that you not alter Word’s Normal.dotx template. Every change you make will end up in subsequent files, including templates. You might think that’s what you want, but in truth a small change can have unintended consequences that are difficult to troubleshoot months down the road. I advise that you leave Normal.dotx in its out-of-the-box condition as much as possible and create custom templates as needed. Many users customize Normal.dotx and never suffer for it, so it’s a rule you can break if you work alone and understand the potential for errors. Documenting your changes is a good idea. Users often worry about where Word saves template files. It’s not a secret, but Word does attempt to corral templates to create a more seamless experience for you. When you choose Word Template (*.dotx) from the Save As Type dropdown, Word automatically stores the template in a designated folder (Figure A). You can save he template someplace else, but I don’t recommend doing so; let Word handle things for you and you’ll experience few (if any) problems. Click the File tab and choose Options. In the left pane, choose Save. 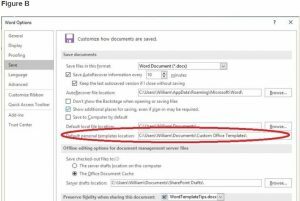 In the Save documents section, change the Default personal templates location folder (Figure B). Changing the default folder keeps Word in the loop so that implementing templates continues to be a seamless process. If you manually save a single template to a different location (which I don’t recommend), that template won’t be easily available to you as other templates are. The best time to apply a custom template is when you create the document using the New option (on the File tab). 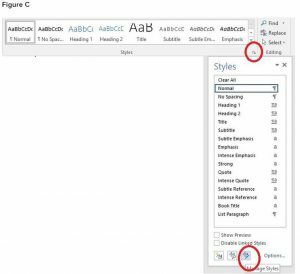 Word displays two template categories: Featured and Personal. To choose one of your custom templates, click the Personal tab and then click the custom template you want to apply. 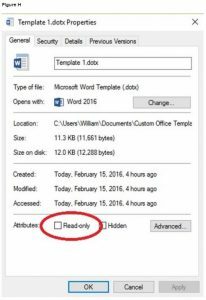 Word opens a new document based on the specified template. After applying the template, all the styles in the template are available in the new document. But don’t ignore the Featured templates. You might find exactly what you need and save yourself a lot of time. Word lists files you’ve saved in the default template folder (#4) in the Personal templates (#5) list. 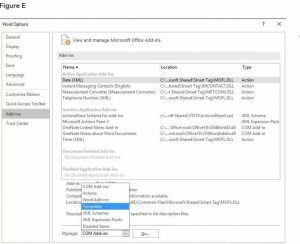 If you don’t see a specific template listed and you want easy access via the Personal link, you must save that template in the default folder. I’m repeating myself—but for the best template experience, you must let Word control the process. You can build a style from scratch or you can copy it from an existing document. Simply select a paragraph that carries the style you want to copy and copy that paragraph to the Clipboard. Then, access the template file and paste the styled content from the Clipboard into the template file. 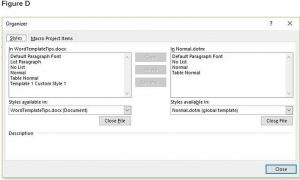 Select and delete the content and save your template file. The style remains in the template file even though you deleted the styled content. Note: This copy tips works for all files, not just template files. Click the Styles group dialog launcher to open the Styles pane. Click Manage Styles (Figure C). In the resulting Manage Styles dialog, click the Import/Export button to display the Style Organizer (Figure D). The list on the left displays styles in the current document; on the right you’ll see styles in the active template. Users often find this interface confusing because it’s so flexible. You can close one or both files and open others—or not. In a nutshell, you want the file that contains the styles you’re copying and the template to which you’re copying those styles. Select the style you want to copy (in the source file) and click Copy to copy that style to the template file. Click Attach and Word displays locally stored templates. Select the template you want to apply and click Open. 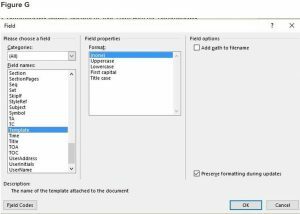 Checking the Automatically Update Document Styles option (Figure F) will update styles in the current document with styles in the template of the same name. Attaching a template after the fact won’t modify manual formatting. In addition, styles in the current document with no like-named counterpart in the template won’t change. 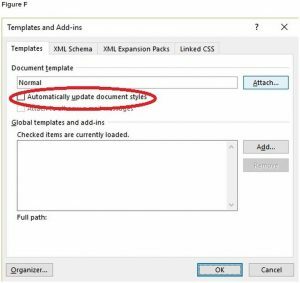 Don’t confuse the purpose of the Automatically Update Document Styles option with the Automatically Update option for styles. The latter option updates the underlying style to reflect manual formatting changes. This option triggers one of Word’s most misunderstood behaviors so I recommend using it with great care and informed intent. Otherwise, you may find all your similarly styled content updated when you meant to update only the selected text—and you might not know how to undo the change. Position the cursor where you want to insert the template name. Click the Insert tab and choose Field from the Quick Parts dropdown (in the Text group). In the Field Names list, select Template (Figure G). Choose a formatting option and check the pathname option as required. Joan creates a letter based on Letterhead2.dotx. Later, John does too, but he updates a style or two in Letterhead2.dotx. Joan opens her letter later and finds the formatting has changed. Use File Explorer (or My Computer) to locate the template file on the server. Right-click it and choose Properties from the context menu. On the General tab, check the Read-only option (Figure H) and click OK. Anyone can make a template read-only to protect it from unwanted changes. If you need to modify the template, simply repeat the process to uncheck the Read-only property before opening the template. Word defaults you can customize the way YOU want! If you are a small to midsize business in South Florida, and you want to turn technology into a power tool that can move your business forward instead of a problem that costs you time and money, then we can help! Your Technology Partner of Palm Beach County Florida is both a Computer Networking Company & an IT Consultant who provides Computer Networking Services, Computer Network Repair, IT Consulting, Hosted Exchange Server Email Hosting, Computer Repair Service, Partner Plus Technology Management, Managed Offsite Remote Data Backup, Network Design, Integration, Support & Internet Gateway Security in West Palm Beach and surrounding communities in Palm Beach, FL. We provide Palm Beach Florida area companies with IT Consulting, Computer Repair Service, Partner Plus Technology Management, Managed Offsite Remote Data Backup, Network Design, Integration, Support & Internet Gateway Security in West Palm Beach and surrounding communities in Palm Beach County, FL.